VIP Jeans is a sturdy cotton twill textile in which the weft passes under two or more warp threads. This twill weaving produces the familiar diagonal ribbing of the Vip Jeans that distinguishes it from its particular cotton . A unique type of dyeing also creates denim’s fading characteristics, which are unique from VIP Jeans compared to every other textile brands. Our choose patterns of fading in VIP jeans, caused by prolonged periods of wearing them without washing, have become the main allure of dry denim. Such patterns are a way of “personalizing” the garment..
a) faded lines that are found behind the knees. 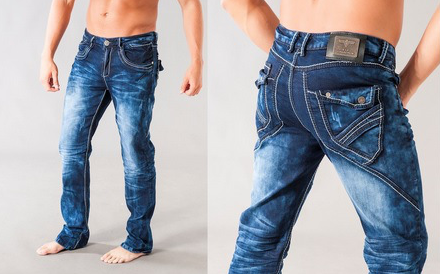 b) faded streaks that surround the crotch area of the jeans. c) Others are created by having the inseam of the jeans hemmed a few inches longer than the actual leg length. These appear on the outseams of the denim. This pattern showcases the selvage by forming two sets of fades which resemble train tracks. In store we always (most of the time)carry the Straight leg, Five pockets, Scrapped VIP Denim. 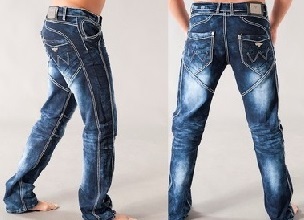 These VIP jeans, are suitable for classy and fashion loving individuals. 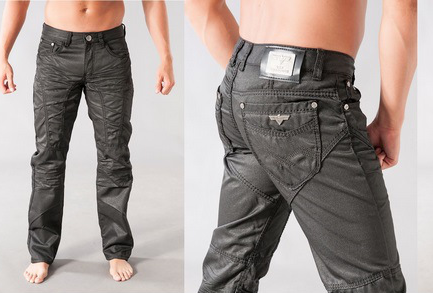 We also carry Straight leg Denim with dark wash, normal zip and button, five pockets In addition to many coated Denim. The model wears all sizes and is made from 100% Cotton. The fitting style we carry at Moist are from Fashional/Leisure/Regular/Straight/Skinny/ Boot-Cut. We At Moist we also carry Dry or raw VIP denim which is denim that is not washed after having been dyed during manufacturing. Keep in mind that over time, your VIP jeans will usually fade, which is considered desirable by some of us. However the process of wear, fading will usually occur on those parts of the article that receive the most stress. In a pair of Vip jeans, these parts appear to be the upper thighs, the ankles, and sometimes also the areas around the knee. Most VIP jeans are are washed to make them softer and to reduce or eliminate shrinkage and guarantee a proper fit to the new owner; also most of our VIP jeans are artificially distressed to produce that so much wanted “worn” look. This it resembles dry denim which have faded. It is this very process creates what many VIP Jeans enthusiasts feel to be a more ” very natural and better ” look when compared to the look the only many artificially distressed jeans denim out there on the market. At Moist Melrose we have many colors in our store: with many shades of black colors and other colors, such as red, pink, purple, gray, rust, mustard, and green. This variety of Vip jeans is created by varying the time and the Sulfur dyeing quantity and the heat of which the craftsmanship expose the various Vip Jeans to in attaining the various shades that VIP jeans are well known for. Also same of our VIP jeans that we regularly carry in our store incorporates an elastic component that is blended with its fabric, the spandex. This creates a certain amount of “give” in the jeans to more comfortably fit. 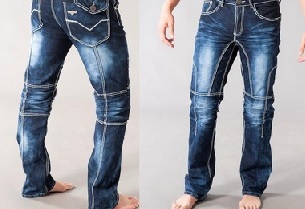 However to keep in mind when washing at high temperature because that may shorten the wearing life of the jeans. The number of time you washed your VIP jeans will affect the color shade of your Vip jeans, the sooner you wash your denim, the less chance you will have for sharper fades. This is because one of the primary steps in manufacturing raw denim is the color treatment stage, where the VIP jeans is dipped in vats of dye (most of the time natural or synthetic).This is because the indigo is not 100% absorbed into the material, after you wash your jeans , so you are losing even though a small % of deep blue or black color l ( this because of due to starch loss). Due to the natural indigo bleeding during washing, even if minute quantity is best to wash your raw denim separate from other clothing pieces. Always hang dry flat. Do not place on a heat radiator, use a dryer, or crumple when drying, as it may damage the fabric and the fit, fade, contrast, and overall quality. If you ever spill any liquid on your VIP jeans, try dry rubbing or dabbing with a paper napkin. It is best not use soap or any other cleaning solutions since in so doing there could be a risk of creating an uneven fade. Mix in a small amount of very light washing powder, designed to lock in darker colors. Do not use bleaches if light washing powder is not available use regular laundry detergent.